My 1950s house sits amongst many, with lots of mature green open spaces around, including five children’s play parks within about five minutes walk of my front door. Despite this, I found that last summer, the local kids would spend more time in my front garden in one day, than I ever did in a year. It’s about 55 feet long, and predominantly weed-filled grass. A nasty looking, wonky but very sturdy, rusty, 3 foot high metal white fence runs along one edge, and immediately on the other side is a public footpath down the side of my property to one of the many play parks. The fence is not mine… sadly. The front is open to the pavement and road, and the other side is my driveway – so, it’s open on two sides. However, this sturdy but nasty fence has been a favourite thing for kids to climb – I’m sure i’d have wanted to do it when I was their age, so I can understand why. However, now that I’m a miserable bill-paying adult, I don’t want the neighbourhood kids in my garden, dancing around my lawn and climbing the fence. I’ve very carefully and politely asked a few not to do it because it’s not safe, and not their garden. All obeyed my request at the time, but several took delight in disobeying later. One young girl also scales neighbours six foot fence to steal apples and pears – sounding like something out of a 1950s Ladybird book! 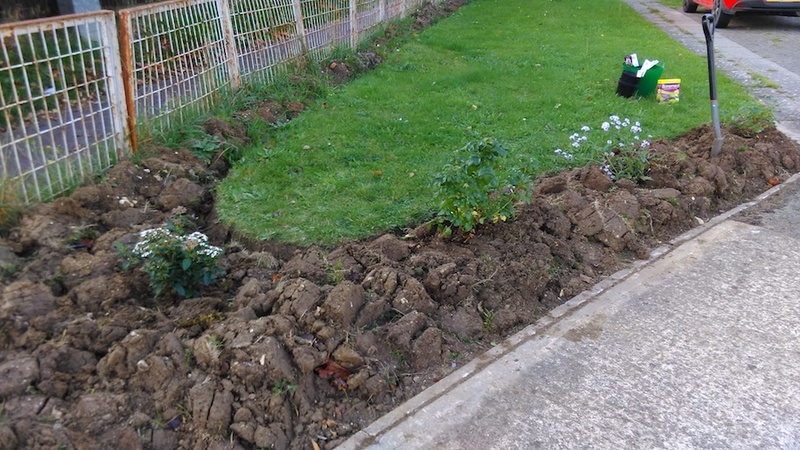 I therefore dug a border up to the fence, and planted 55 feet of Hawthorn ‘Crataegus Monogyna’ and Blackthorn ‘Prunus Spinosa’ along it, and dug a border at the front of the garden along the path. I’ve planted a few shrubs and roses in that front border, and the kids seem to have finally gotten the idea. 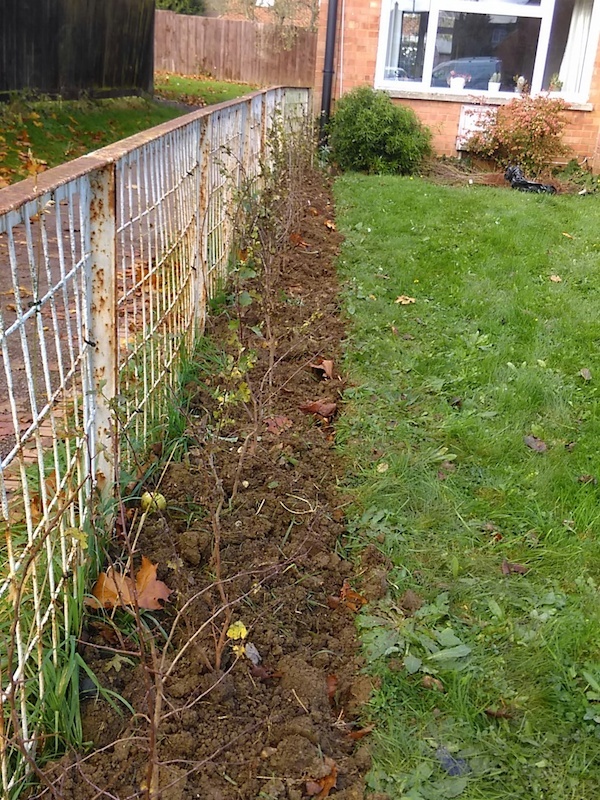 The hedge is of native species of Hawthorn and Blackthorn and should hide an ugly fence, and provide for wildlife. I’m hoping that in March, the Hawthorn and Blackthorn all begin to bud and burst out green shoots. 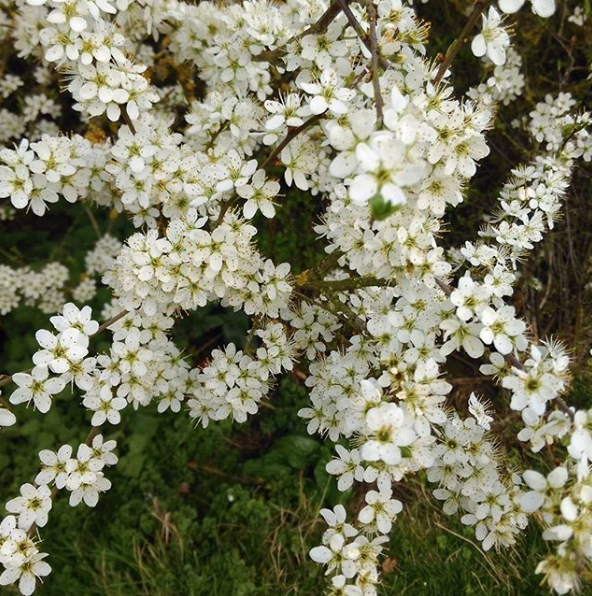 This Blackthorn used to grow on my walking route from my old house. Look at the flowers, at the flowers, at the… OUCH! I purchased these plants from Hedge Nursery in Telford, Shropshire, back in August at the height of the kids use of my garden (about 10 a day across my lawn), and they were delivered at the start of November as bare-root 2yr old plants. I soon set about planting them out, and heeled in a load of spare ones in the back garden in case not all of them took. The front border has roses and various shrubs to close in the front of the garden. I’d like to think that options 1 and 2 will work well at least – and hopefully it’ll be a well established hedge, hiding the ugly fence (I’ll need to cut it to about the same height), and provide a home to a few happy birds nests by the time I think of selling and moving on. Previous Post Why isn’t it Spring yet?